It’s commonly thought that we should work to be happy. But what if we turned this idea on its head? 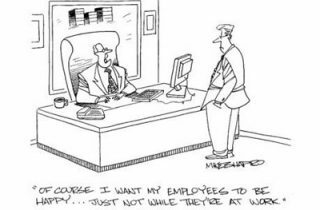 As the next in our series of ‘Talking Leadership‘ blog posts, we focus in on what makes us happy at work – taken from the TED series of lectures. Psychologist Shawn Anchor gives an entertaining and humorous talk in where he argues that happiness actually inspires productivity. Do you agree with Shawn that happiness comes first and productivity leads on from that? Let us know what you think by posting a comment, contacting us on 01865 881056 or emailing us at info@leaderslab.co.uk.